Who is the woman in this photograph? 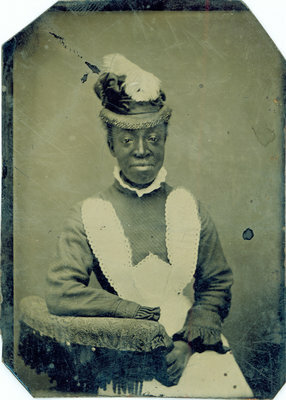 An unidentified woman with feathered hat poses in this small black and white tintype photograph. The corners have been cut, and there are several scratches and blemishes on the surface. The name of the photographer and the location of the studio are unknown. This tintype was in the possession of Iris Sloman Bell, of St. Catharines, Ontario. The Sloman - Bell family relatives include former American slaves who settled in Canada.